Good elasticity, abrasion resistance, solid and strong. Fit boots, sneakers, casual and dress shoes-- Wrap the front around your toe section, then stretch the back around your heel. Takes only seconds to put on and take off. Thermoplastic elastomer with excellent elastic & high density manganese steel to ensure the maximum durability. Securely attached to your footwear & these slip-on spikes can dig into all types of terrain - ice, packed snow, wet rocks, concrete, and scree Simple rinse clean via the tap or hose. Reduce the risk of injury from slips and falls when walk on ice, snow, mud and wet grass or other poor conditions. Perfect solution for your winter worries, solve the problem of 'how to stay on your feet on ice and snow. Increase the productivity and enjoyment of a day on the winter outdoor. ( Camping Hiking Fishing Hunting etc ). 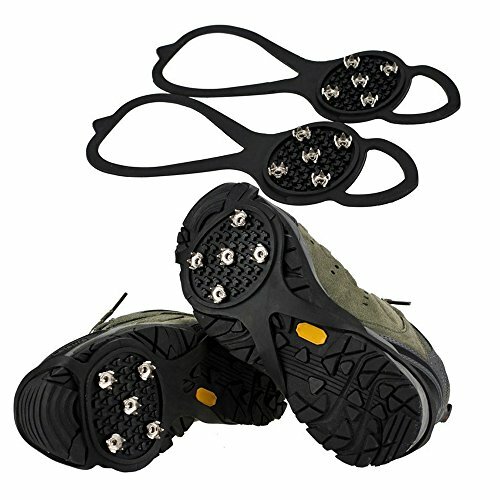 HIGH QUALITY STAINLESS STEEL SPIKES - Reduce the risk of injury from slips and falls when walk on ice, snow, mud and wet grass or other poor conditions.A clever, unique design, these snow and ice grips provide excellent traction throughout the sole of your foot. These slip on grippers are brilliantly convenient. SAFE & DURABLE FOR YOUR NEED - Securely attached to your footwear & these slip-on spikes can dig into all types of terrain - ice, packed snow, wet rocks, concrete, and scree.These are easy to put on and very effective for the coming adverse weather conditions, they reduce the risk to slip. CONVENIENT TO TAKE ON/OFF & EASY TO CARRY - Easy on/off to fit boots, sneakers, casual and dress shoes-- Wrap the front around your toe section, then stretch the back around your heel.You can stretch them easily over your existing shoes or boots and you are good to go.